We are all knows about Google Web Fonts having such a wonderful collections font families. It is very useful to all especially for designers and webmasters. After released Google Web fonts for docs at May 2012, now Google announced that is bringing 450+ new fonts to Google Presentation too. So you can create amazing slides with 450+ new fonts in Google Presentation. If you already added to Google Documents it will automatically appear in your Presentations too. Other wise add manually by below steps. 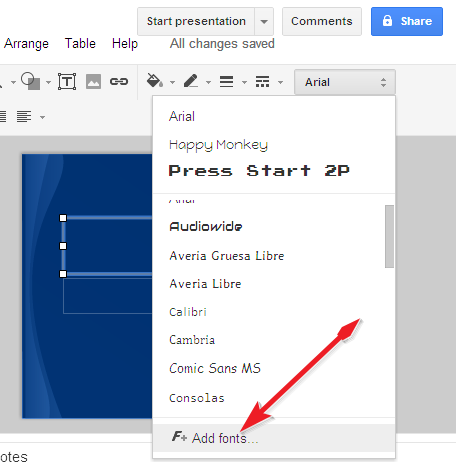 Go to Google Presentation then click on the font name it shows your font lists. To add more Google fonts click on the Add Fonts links from bottom of drop down menu. It will take you to the Google Web Fonts section, where you can pick the ones you want to use. 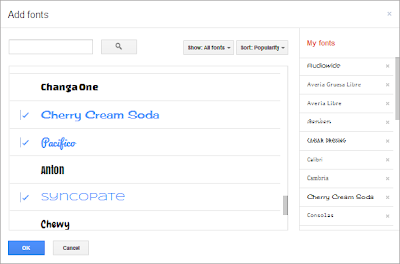 Select your lovable fonts, if you select any fonts it will automatically added to your font list. After selected click the OK button. That's all selected new fonts will be highlighted in font list. So here after you can create amazing presentations and documents using Google Web Fonts.